Last Saturday (2016/11/19) I participated in a small local event organized again in one of the stores in Canberra, THREE D6 . 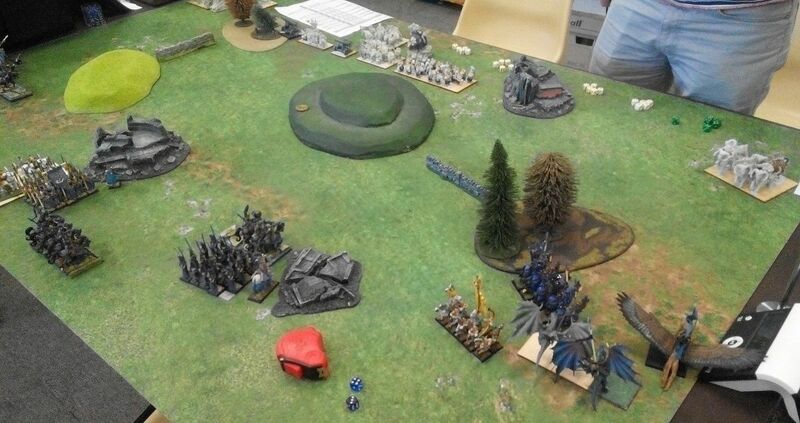 This event was organized with Clash of Kings players pack, Matt who is the main organizer of the Clash of Kings Australia event in late January 2017. It was meant as a practice before that tournament and a test of the player's pack in case it may need some further tweaks. This army was a bit of a more radical approach in comparison to the previous version. First main change is that there is no Bolt Thrower. It is a very reliable war engine and I would love to find point for at least one but in order to accommodate the changes I decided to let it go. Also, since the emphasize of the new army is on movement phase and multi charges, removing static war engine was also a move to that direction. Next was an addition of a second Drakon Riders regiment. I have just painted 3 models that initially were meant to form a single regiment. However, I have also received extra pair of wings thanks to Eastern Barbarian and I have already modeled 4th Drakon Rider. That allows me to create 2 regiments. Again, having 2 regiments instead of 1 Horde with an upgrade is to reinforce the theme of the army that relies on maneuverability rather than sheer power to overcome the enemies. 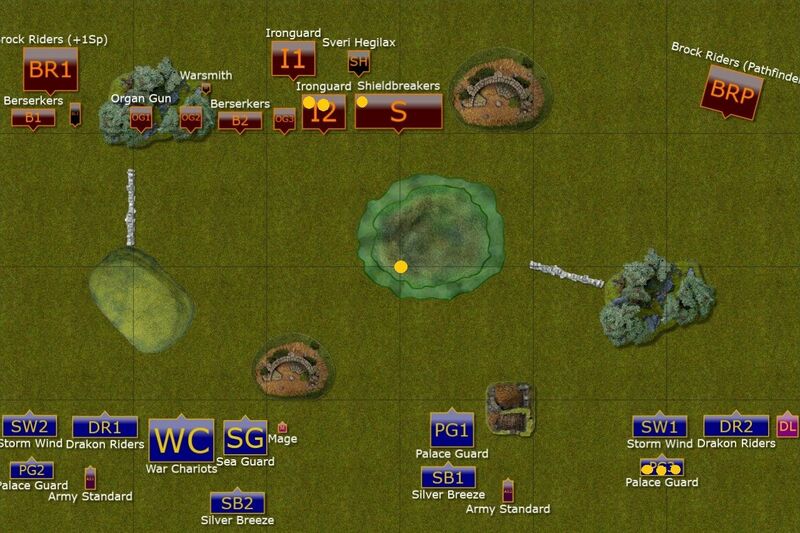 Testing the new version of the army was one but not the only objective. I wanted to see if I can speed up my game further in order to be able to deploy fast enough to have time for games with 7 turns for each player. Previous tournament showed I am getting there so hopefully I could achieve that too. Out of 12 players who expressed interest in this event, 10 showed up eventually, which was great. We also had 2 players coming down from Sydney and boosting our numbers. That was simply fantastic to have a support of the fellow players from interstates and I hope we will have more occasions to host them in the future. Personally, I am also hoping to travel at least to Sydney once in a while too. Elves won the popularity contest but each army was significantly different from each other so that actually added to the variety. What is more, only 4 players (me including) took part in the previous event. That is good news because it means that the player base for future tournaments is bigger and potentially we can have 10+ players local events. Which I find quite important if we want Kings of War to keep growing. 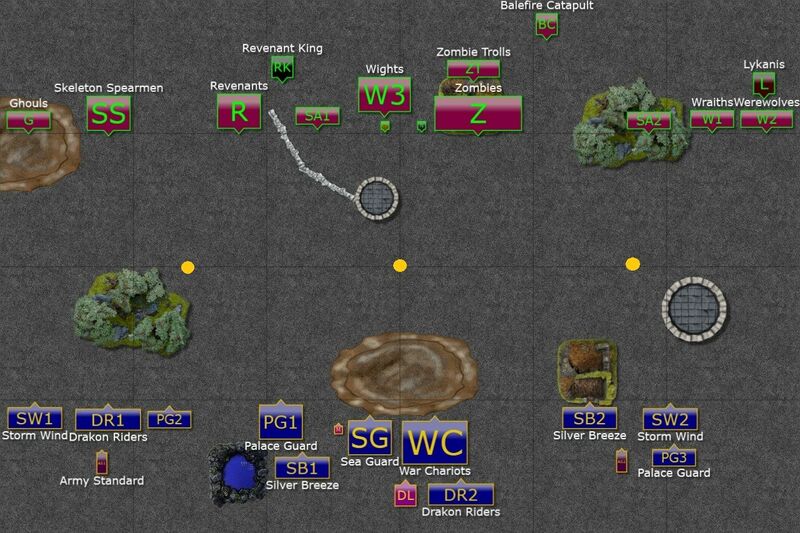 Here are some teasers from my four games, the pictures and deployment diagrams as well as army lists of my opponents. 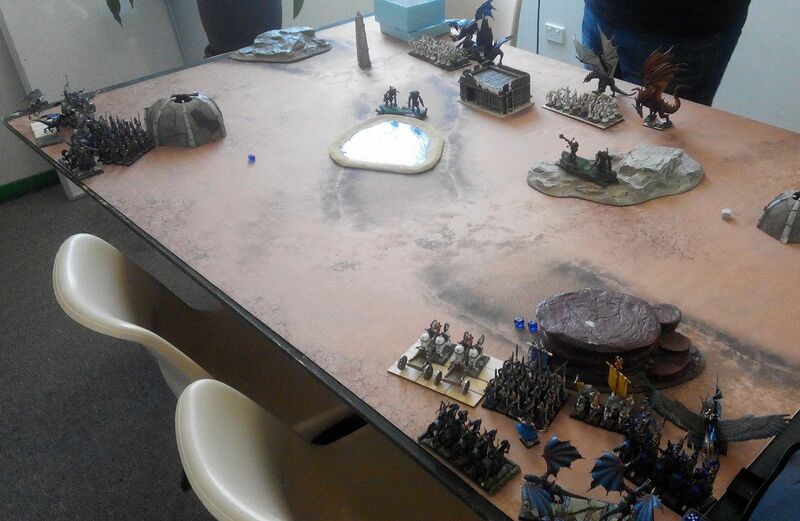 Dwarfs vs Elves - classic! 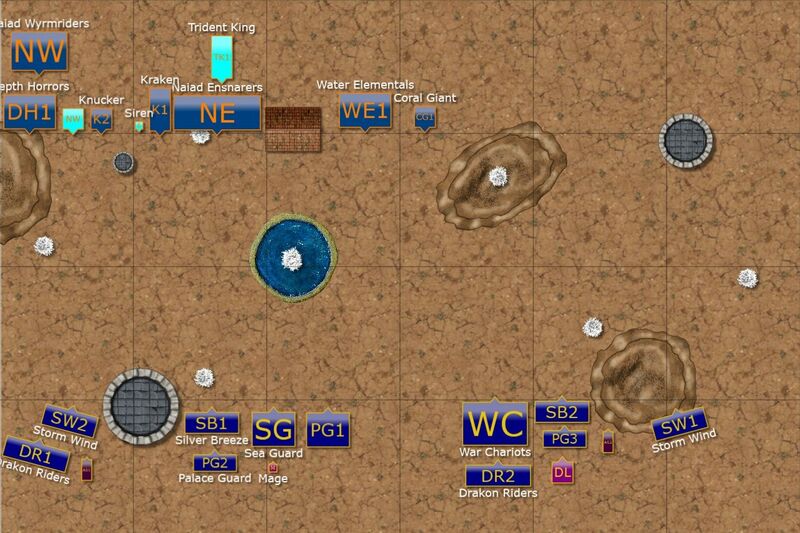 Deployment and Loot tokens placement. I will do my best to write the reports as soon as possible but as always, I would like to ask for some patience. In the meantime, I am very curious about your predictions and any other comments you would like to share! Game 1 - horrid early v2 elf meta list. Hope you smashed them. I reckon you will have closed down those archer blocks quick enough. Game 2 - really looking forward to this one. You are in for a torrid time on one flank. I've never sent tridents used really well, so hopefully this is the guy. 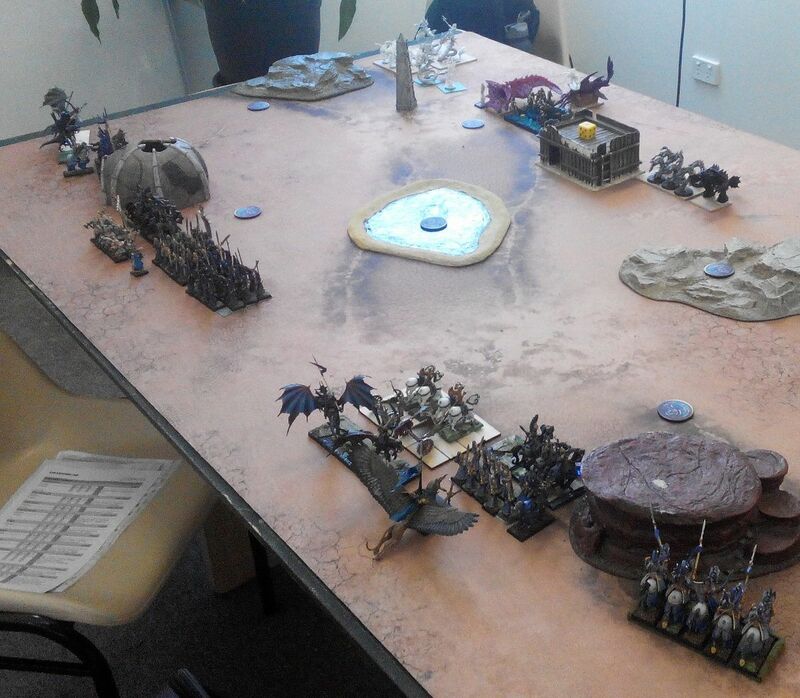 Game 3 - reasonably tough dwarf list, but I reckon he has already lost on deployment. The isolated brick regiment is toast, then roll up, roll up! Game 4 - clearly an opponent who loves his fluff. 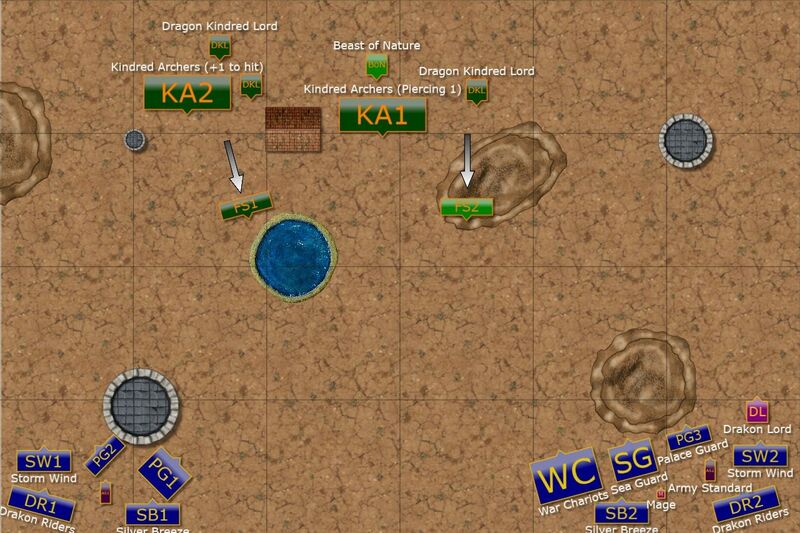 Doesn't always make for the most ruthless opponent, Good variety of units. I'd have more werewolves, but should be a great tussle. Can't wait. Once again I'm way behind in the reading material but not to worry. This is an interesting list from you as it has certainly brought in some faster elements to the army with the sacrifice of shooting. I wonder as well if the clock during gaming has also impacts on this choice? With a smaller shooting phase to worry about often times you can skip it all together? Out of interest SM what was the Undead army that played? Kingdoms of Dust? The first Elves army you're facing looks rather power 'gamey' just running massive hordes with a few combat elements to back it up. Almost a carry over from that other fantasy game. The advantage you have however is he simply can't overwhelm all of your units with shooting so I'm thinking you'll easily get the flanks and win the day. Looking forward to seeing it. I don't think one less bolt thrower would make a big difference on the time I need to make decisions. After all I have the same number of elements. In fact, bolt thrower, once positioned, is quite straightforward to use. Just need to make a decision what to shoot at. While having a few more but smaller units requires constant checking for angles and LOS. But yes, with shooting that is not the main weapon of the army I have that option to skip it and make sure I am not going to time out. The Undead army is generic Undead from the main rulebook. The first army is definitely tough but I think it was not the most extreme yet. It is because my opponent didn't bring wizards to further boost the shooting efficiency, his dragons didn't have 6+ defense or regeneration etc. They are still hard to kill as they are, can be very flexible with both, good melee and ranged attacks abilities and being extremely maneuverable. I have the maps made so it is now all about finding time to write it all up! Hey, Swordmaster! nice to see you are doing well. I've been eyeing KoW for some time now, though I haven't been able to find people to battle with in my area. Regardless, I like theorycrafting, so I've been doing some lists and thinking about the game at large, and I've got to say that the list I came with was mightily similar to what you are running. I'm very interested to read how the tournament went. Also, I'm curious, what are you using as drakon riders? They seem like Cold One Knights with dark pegasus wings, but the pictures are a bit blurry to see. I am always happy to discuss lists and all things Kings of War! I like the game a lot and while I am still searching for the "perfect" list for myself I think I am getting close. As a spoiler I can tell you that I was very happy with this army and I didn't feel I miss my Bolt Thrower or heavy cavalry regiment. I quite liked the idea of the Stormwind regiment with caterpillar potion, certainly, but I do think that the dual drakons riders and the drakon lord offer more redundancy and should work well together. Shooting I don't feel is as critical in a list like this one - while shooting can be very useful to force the enemy to engage, in this kind of list I don't think that's so necessary - instead, I see shooting as a tool to deal with certain threats (mainly enemy shooting, in fact), so I agree that the bolt thrower, while useful, isn't mandatory. Many thanks for the tips on the drakons. I've been looking for models that could work. Another idea I saw was using reaper's Young Fire Dragon as mounts, but they didn't look quite right. Storm Wind regiment with Pathfinder is obviously very good. No wonder similar units are so popular among the players. But I wanted to try a different option simply to break from the "fashion" and see if I can play successfully without it. After this tournament I believe I can and I will keep practicing with this army from now on. Shooting is considered to be essential to have in some form by many players. I like it because I like the armies that can do something in many different phases of the game. It also adds to the variety of options. But it was pointed out that at some stage I relied on it as a main weapon to win games. And that was not the direction I wanted to pursue so again, I decided to move to the army that requires focus on movement and maneuver. The idea about the drakons was used by many players independently. I just happened to add a few personal touches such as banners and combination of different parts for the knights. People indeed use many different options but I think this one looks good too. I am glad you like it!